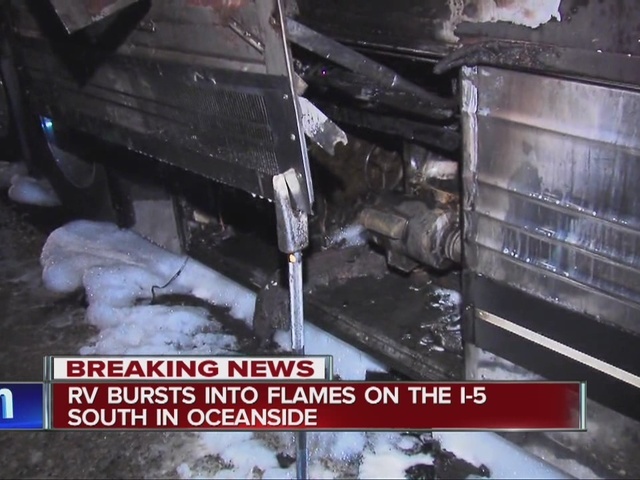 OCEANSIDE, Calif. – An RV that was transporting a band and their equipment down to San Diego caught fire early Wednesday morning on Interstate 5 near Camp Pendleton. The RV carrying the band “Reverend Horton Heat” caught fire on southbound I-5 near Las Pulgas Road before 4:09 a.m. The RV pulled over as smoke billowed from the vehicle. The band and its crew were able to get out safely. There were no injuries. Camp Pendleton fire crews responded and extinguished the blaze. Two southbound lanes were blocked. "It happened very quickly," said lead singer and band founder Jim Heath. "I woke the guys up as quickly as I could and tried to get them out of there because it was already filled with smoke." The fire is believed to have started in the RV’s generator compartment, according to OFD officials. It was charred and black after the fire. The RV was towing a trailer carrying the band’s equipment. The trailer was not damaged. The Reverend Horton Heat are scheduled to perform Wednesday night at the Belly Up Tavern in Solana Beach. Band members told 10News there are no plans to cancel the show.